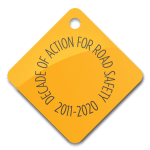 The GRSP Signpost is our quarterly newsletter designed to share with you the important work both GRSP and other road safety actors are doing all around the globe. By sharing successes and challenges, we hope to encourage others to join the effort to reduce the unacceptable burden of road crash death and injury being placed on countries, cities and communities all over the world. Please, read the January edition of the GRSP Signpost here.